ODARS took park in SSB Field Day on 1 September 2018 in perfect weather – see photographs below. Reading the report on Dayton Hamvention 2018 in the July issue of RadCom my attention was caught by the comment “One ham was delighted to find an antenna for a WW2 radio altimeter and so complete his set.” Now there’s a coincidence. I was at Hamvention this year and one of the items on my flea-market search list was a second AT-4/ARN-1 antenna to complete my RT-7/APN-1 radio altimeter kit. Could there have been two people looking for such an obscure item to complete a set? Could there have been more than one on sale? It seems unlikely. How KC0G, who wrote the item, got this news I do not (yet) know: maybe he sat near me at lunch. Here is a short note to explain the details. The story started at the Newbury Rally, about six years ago, when I saw an RT-7/APN-1 transmitter-receiver unit for sale in near mint condition. This is the heart of a 440MHz frequency-modulated radio altimeter. It is designed to both measure and control the height of an aircraft in the range 0 – 4000 feet and over 10,000 sets were manufactured for the American Air Force during WW2. The unit is neat in its use of ‘acorn’ valves in the r.f. sections, and also an electro-mechanical variable capacitor to frequency modulate the transmitter. The latter was to an extent the unit’s downfall when they appeared on the surplus market. During the late 1950s or thereabouts one of the popular magazines ran an article on an f.m. 10.7Mc/s (we had cycles in those days) i.f. alignment generator using this capacitor and as a result many units were stripped. Some attempts were also made by amateurs to use them on the 70-cm band but the low power output, about 100-mW, limited their usefulness. The principles of operation of the altimeter are described in several articles on the internet and a couple of references are appended. 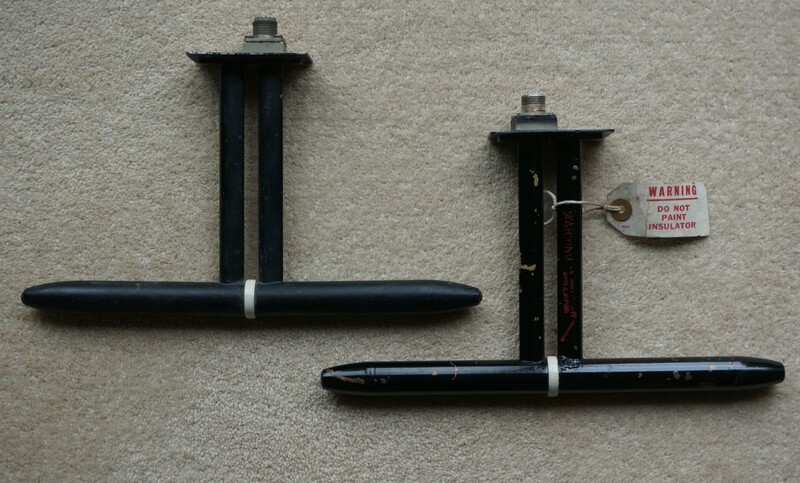 My appetite was further whetted when a later Newbury rally yielded the altitude switch and an altitude indicator meter was found on e-bay. Fair Radio in Ohio U.S.A. supplied a copy of the original manual for the set. The antennas, however, were a little harder to find. I found one antenna at Hamvention in 2013, but these parts are uncommon and I was therefore more than delighted to find a second one at Hamvention 2018. I was fortunate enough to visit the Udvar-Hazy National Air and Space Museum near Washington Dulles airport in 2013, while visiting my friend Frank Gentges (K0BRA), now sadly S.K. a great loss. 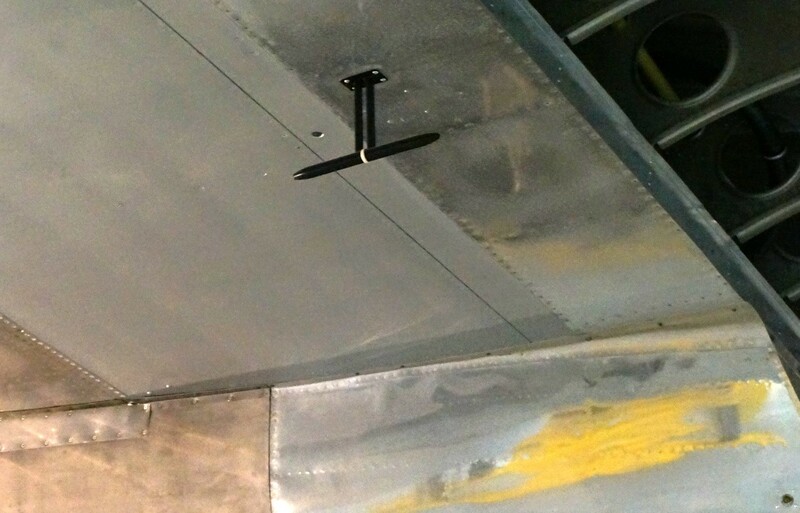 Udvar Hazy has the B-29 “Enola Gay” used to drop the first atomic bomb and I was fascinated to see those two ARN-1 antennas, one under each wing. The aircraft is fenced off from the public, but I persuaded one of the museum staff to take my camera underneath and photograph the antennas. 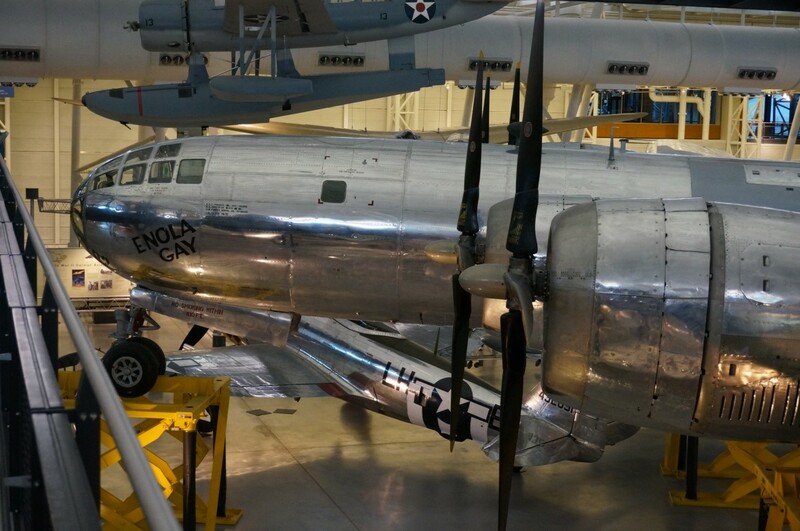 The ‘Enola gay’ in the Udvar-Hazy Museum near Washington D.C. I mentioned the M.I.T. radiation Lab series on Tuesday. These are a twenty-seven volume, plus index, write-up of the work of U.S.A on radar systems during WW2. They are of course dated now but are an important historical summary. The first two volumes are more general in their approach but the introduction chapters of all are generally quite readable. pp 207 – 210 and 284 – 286 of vol1 give some details of the SCR-584, a search and track radar so good that many are still in use today. pp 136 – 141 of vol2 give more details about the APN-1 altimeter. On 12 July the 43rd Scout Group was visited by 4 of ODARS members who demonstrated CW and SSB modes. The scouts had some hands-on experience of Morse code and phonetic alphabetic as part of their Communication badge. The scouts were split into two groups and each scout practised Morse code and was shown the workings of a radio. ODARS set up two radio stations for the event, one to demonstrate and listen to CW QSOs and one for SSB listening. All the scouts showed lots of interest in the event and they did very well, in particular when practising with Morse code. We attended the Newbury Rally on 24 June 2018 and put together a very impressive stall (see above). Many thanks to all of you who helped to make it go well on Saturday. I think everything went to plan, the FT-950 generated and decoded FT-8 signals, Morse code was as popular as ever, Brian’s historical apparatus worked impressively too. I know Colin had some issues with the aerial, but then, don’t we always! We had a steady steam of visitors and many engaged with us. I spoke to an amateur from the USA, and another visitor was going to text a friend in Finland to try and contact us. I even spoke to someone who said he was Marconi’s cousin! It was great to see David Walker, G3BLS there too. Liz’s talk on women in radio telegraphy was interesting and well received, and people looked like they were listening to me on Marconi as well. I believe we made around 25 contacts on FT-8 and 2 on CW (thanks Colin). I do have the log in ADIF format and I’ll translate it into human readable and distribute shortly. Robyn, the MHS Public Amazement Officier, took many photos which she will share with us. Anyone else who has good shots of just the ODARS team (no public) please sent to Mark for the web site. Thanks again to everyone who helped make it happen. On 21 November 2017, Ken Taylor, M1SLH, gave a talk about FT-8 Digital Mode. In July of this year a new digital mode was added to the well known WSJT suite of software for weak signal contacts. It is very sensitive and particularly fast, each exchange taking less than 15 seconds, and has become extremely popular. Using forward error correction, advanced signal processing techniques and a very narrow bandwidth it had proved an easy and reliable way of making DX contacts on HF under less than favourable conditions as we slide down the sunspot cycle. This talk centres on setting up and operating using FT8, without delving too much into the technicalities of how it does it. It is also planned to give a live demonstration. As several members have already been using the mode for a while, there will, no doubt, be an exchange of tips and tricks afterwards. There were nine members present, one visitor who later joined, and our guest speaker Phil Miller Tate M1GWZ from Walton on Thames. Several apologies for absence were received. a botched attack on it by the German SS pretending to be Polish insurgents, giving Hitler an excuse for invading in 1939. It was a thoroughly interesting talk and delivered in an entertaining manner. Today the station is a museum, and the larch wood tower still survives, held together with brass bolts replacing the original stone hardware. The tower now supports mobile phone antennae, and a low power FM station on 93.4MHz, for any FMDX fans. We also welcomed James, M0JHF (also K0FOZ) from Cumnor, who has joined ODARS. The next club meeting will be on Tuesday 3rd October. came and chased us away!